Returns a random variate from an exponential distribution. is the seed value. A new value for seed is returned each time CALL RANEXP is executed. Note If seed ≤ 0, the time of day is used to initialize the seed stream. is a numeric variable. A new value for the random variate x is returned each time CALL RANEXP is executed. The CALL RANEXP routine updates seed and returns a variate x that is generated from an exponential distribution that has a parameter of 1. 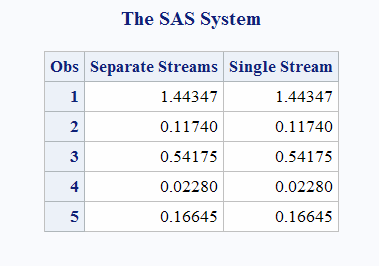 By adjusting the seeds, you can force streams of variates to agree or disagree for some or all of the observations in the same, or in subsequent, DATA steps. The CALL RANEXP routine uses an inverse transform method applied to a RANUNI uniform variate. For a discussion and example of an effective use of the random number CALL routines, see Starting, Stopping, and Restarting a Stream. The CALL RANEXP routine gives greater control of the seed and random number streams than does the RANEXP function.